Economy combined with consistent performance in this chicken base, perfect for poultry entrees, soups and casseroles. SALT, SUGAR, CORN STARCH, SOYBEAN OIL, PALM OIL, MONOSODIUM GLUTAMATE, CHICKEN FAT, TURMERIC, DISODIUM INOSINATE, DISODIUM GUANYLATE, NATURAL FLAVORS, MALTODEXTRIN, CORN SYRUP SOLIDS. 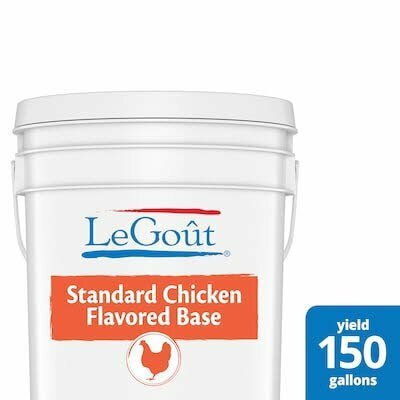 CHICKEN SOUP: Add 1 pound of standard chicken flavor soup base to 5 gallons of boiling water. For small quantities, add 4 ounces, or 1/2 cup, to make 5 quarts of boiling water. Add other ingredients as desired. OTHER SOUPS: To soup prepared as above, add desired amount of well drained, cooked egg noodles, or cooked rice. TO PREPARE CREAM SOUP: Add desired amount of base to a hot, medium white sauce. CHICKEN GRAVY: Combine fat or pan drippings, flour and milk or water. Add Standard soup base to suit taste.